Commonly cited pros across these award-winning products were customizability, reporting capabilities, and support for the ITL framework. Reviewers also highlighted the importance of an easy-to-use interface for admins as well as end-users. TrustRadius, the most trusted B2B review platform, today awarded 2018 Top Rated Badges for IT Service Management Software to help buyers make more informed purchasing decisions. The TrustRadius Top Rated awards are unique in that they are an unbiased reflection of customer sentiment, based solely on user satisfaction scores. They are not influenced by analyst opinion, the vendor’s company size, popularity, site traffic, or status as a TrustRadius customer. "The ITSM category represents a range of products, all broadly focused on delivering satisfactory service to end user customers using best practice models," said Megan Headley, Research Director at TrustRadius. "However, some products are tightly focused on ITSM, while others include additional capabilities, or provide APIs and connectors making it easy to integrate to hundreds of other related products like workflow or asset management. Differences between product offerings in this space are not immediately obvious. User reviews can help buyers understand important factors like product usability, integration to related products, and customization to ensure that the platform works well in a specific corporate IT environment." In addition to overall Top Rated awards, TrustRadius also recognized tools that are top rated in a specific market segment, as company size is one way to help buyers identify the right solution for their use case. To qualify for these lists, at least 15% of the product’s reviews and ratings must come from that market segment. 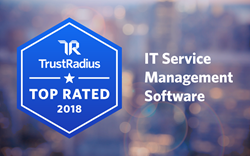 For the faceted Top Rated list, as well as more information on the overall Top Rated products and Top Rated criteria, visit the TrustRadius 2018 Top Rated IT Service Management Software page. Products included in the 2018 Top Rated IT Service Management Software list must be in the top tier of their category TrustMap to earn a Top Rated badge. To qualify for the IT Service Management TrustMap, products must have at least 20 reviews and ratings on TrustRadius. Every reviewer is verified and every review is vetted before publication. Products are plotted on the map based on end-user data, including users’ likelihood to recommend scores as well as buyer research patterns. TrustRadius is the most trusted review platform for business technology. We help buyers make confident decisions with in-depth reviews and ratings from real users. We also help vendors engage and convert buyers by putting their customer's voice to work, authentically and at scale. Headquartered in Austin, TX, TrustRadius was founded by successful entrepreneurs and is backed by the Mayfield Fund and LiveOak Venture Partners. For more information, visit TrustRadius.com.